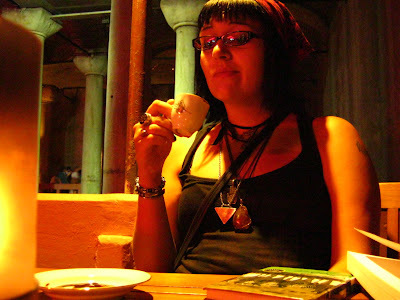 I have officially found my favourite place in Istanbul to sit and linger over a syrupy strong cup of Turkish Coffee: The Cistern cafe hidden deep inside the dank underground caverns of the Basilica Cistern. Built in the 6th century AD by late Roman emperor Justinian as a giant underground water depository, the Basilica Cistern is a gigantic 105,000 sq foot space dimly lit with orange lights and the occasional candle. Hungry carp swim freely under the recently constructed walkways and the 336 stately Roman columns scattered throughout create a magical labyrinth feel only added to by the 2 mysterious giant carved heads of Medusa that sit in the NE corner of the Cistern. It has been suggested that with all the heavy traffic above (the Basilica sits under the most heavily visted area of the city, in old Sultanhamet), that the structure is in dangerous risk of collapse, but this danger element only adds to the appeal. There is a great echo effect created by the din of tourists circling the place, snapping photos and aimlessly walking, but very few people seem to take a seat at the little red-neon-signed cafe hidden in the south corner (perhaps preferring to socialize and get their caffeine fix above ground? what nonsense!). 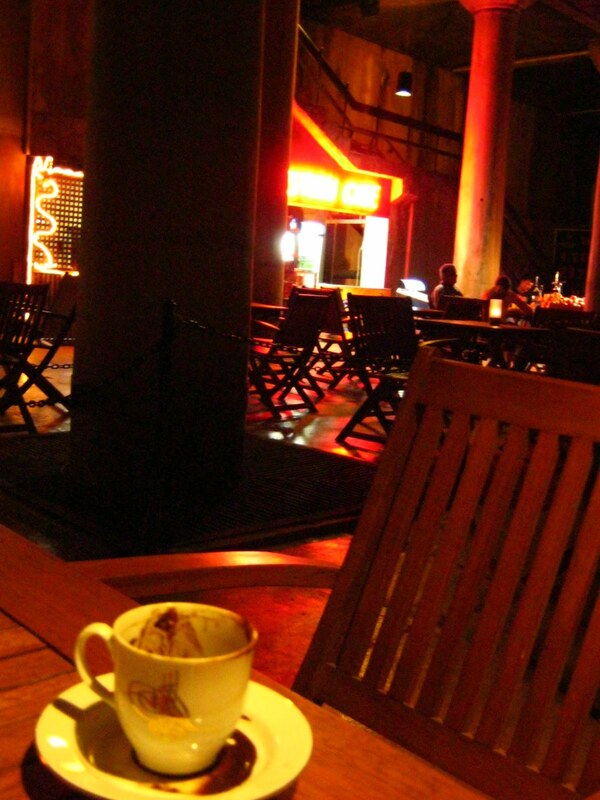 This leaves introverts such as myself with the perfect place to sit and soak up the spooky atmosphere of the place while having a brew of Istanbul's finest drink: the Turkish coffee. Wonderful. The problem is of course, admission to the Basilica is 10 lira, which coupled with the 5 for the coffee would make this a rather expensive habit to uphold (about 9 bucks total). Nevermind the fact that huddled in the corner writing this hunched over a candle makes me appear a bit of a freakish quasimodo-like character... then again, at this point, I am rather used to appearing this way. Maybe I should bring some Tarot Cards here and do readings for the tourists. I love it here. I never want to ascend above ground. I imagine living in this city and how wonderful it would be to come here on my days off and treat myself to this expensive coffee in this special subterranean place, how maybe after awhile the officials would recognize me and stop charging me the entrance fee and I could pen poetry and short stories written by candlelight whilst inhaling the spirits of Byzantine ghosts and soaking up the Holy Roman history that I dont know well enough to accurately reference here, but that nonetheless is appealing enough to make me see the faces of saints in my coffeecup grounds. Istanbul, you never cease to amaze me.